Installing your theme is pretty easy! After downloading you should have a evision-corporate.zip file. This is a compressed file containing all of the required templates and images required for the theme to function properly. ‘eVision Corporate’ theme supports 3 types of layout page in the Front page ( Home Page ). For managing static front page. From “Customize” section, go to “Static front page” section. After that you can setup your awesome home page from ‘Front page’ options. For save the changes click on “Save & publish” button to save the changes. An advanced theme options based on customizer give you full control to the content and setting on the theme. 1. From “Customize” section, go to Site Identity or Site Title & Tagline. 2. From the Site title section, enter the site title. 3. From the Tagline section, enter the site slogan. 4. Check “Enable tagline” check box to enable Tagline and uncheck to disable it. 5. In latest version of WordPress : Select Image icon as a site icon is alos0 available. The site icon is used as a favicon and app icon for your site. 6. If the preview is fine, click on “Save & Publish” button to apply on site. 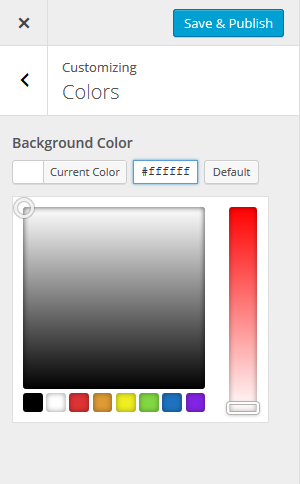 To customize background color, you will find two sections in the customizer. 1. From “Customize” section, go to Color. 2. Select the color for background or enter the color code on field directly. 3. Click on “Save & Publish” button to save the changes. 1. From “Customize” section, go to Background Image. 2. Select the background image. 3. Remove option help you to remove the Background image. Click “Remove” button to remove the image. 4. Change image button help you to change the Background image. Click on “Change Image” button and select another image for background. 5. Background Repeat: Select option from the Radio button for background image appearance. 6. Background Position: Select option Left, Center or Right for background image position. 7. Background Attachment: Select Scroll option for background image scroll simultaneously with page scroll. Fixed option fixed the background image even page scroll. 8. If Preview is fine, click on “Save & Publish” to apply on site. 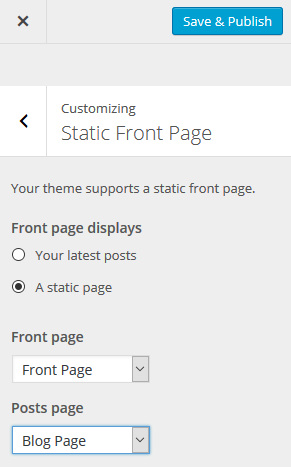 If you have selected A static page : Front page in the previous options, then you can setup awesome home page. This theme support following sections in home page. Each section can be managed from customizer. From customize go to “Front Page“. You can enable all section or only enable some section whatever you want. Slider Section is appeared just below the header section of front page. 1. If slider is needed on your front page below them header section, you can manage the slider for front page from this section. 2. Enable slider section: Checked to enable the slider. 3. Select page for slider: Select one page from the available pages for your first slider. 4. Select page for slider: Select another page for next slider. 5. If preview is fine click on “Save & Publish” to save the changes. About section is appeared just below the slider in front page. 1. Enable about section: Checked to enable about section on front page. Uncheck will hide this section form front page. 2. About section main title: Give the title for about section. 3. About section main content: Write the main content for this section. 6. Repeat the above process for other field of about section. 7. If preview is fine click on “Save & Publish” to save the changes. Note : If you read information, there you will find adding page link. While adding page, please add ‘Title’ and ‘Content’. Service section is appeared just below the about section in front page. Adding Service section is almost same as the About Section. 1. Enable service section: Checked to enable service section on front page. Uncheck will hide this section form front page. 2. Service section main title: Give the title for service section. 3. Service section main content: Write the main content for this section. 4. Service section background: Select the image for service section background image. Click on “Select Image” button and select the image for media library and set the image as a Service section background image. 6. Select page for service: Select the page from available pages on dropdown for service section. 7. Repeat the process for other field of service section too. 8. If preview is fine click on “Save & Publish” button to save the changes. Note : If you read information, there you will find adding page link. While adding page, please add ‘Title’. Portfolio section is appeared just below the Service section on front page. You can simply enable and disable this section on front page. 1. Enable portfolio section: If Portfolio section is need to display on front page, checked it. Uncheck will hide this section form front page. 2. Portfolio section main title: Give the title for portfolio section. 3. Portfolio section main content: Write the content as a main content for portfolio section. 4. Select page for portfolio: Select the page for portfolio section form the available pages on dropdown. 5. If preview is fine click on “Save & Publish” button to save the changes. Note : If you read information, there you will find adding page link. While adding page, please add ‘Title’ and ‘Featured Image’. Client section appeared just below the portfolio section on front page. 1. Enable client section: Checked to enable the client section on front page. Unchecked to hide this section on front page. 2. Client image: Choose the image form media library as a client image. Click on “Select Image” button and select the image form library and set the client image. 3. If preview is fine click on “Save & Publish” button to save the changes. Testimonial section is appeared just below the Client Section on front page. 1. Enable testimonial section: Checked to enable testimonial section on front page. Uncheck will hide this section from front page. 2. Testimonial section main title: Give the title for testimonial section. 3. Testimonial section background: Select the image for testimonial background image. 4. Select page for testimonial: Select the page from available pages on dropdown for testimonial section. Note : If you read information, there you will find adding page link. While adding page, please add ‘Title’, ‘Content’ and ‘Featured Image’. Blog section is appeared just below the testimonial section on front page. The recent 3 posts will display on this section, if you enable it. 1. Enable blog section: Checked to enable blog section on front page. Uncheck will hide this section from front page. 2. Blog section main title: Give the title for main section of blog. As mentioned above, Team section is appeared just below the blog section. 1. Enable team section: Checked to enable team section on front page. Unchecked will hide the team section from front page. 2. Team section main title: Give the main title for team section. 3. Team section main content: Write the main content for team section. 4. Team section background: Select the image for team section background image. 5. Select page for team: As previous sections, select the page for team section. 6. If preview is fine click on “Save & Publish” button to save the changes. Map section is appeared just below the team section. Map section display the map based on latitude and longitude entered. 1. 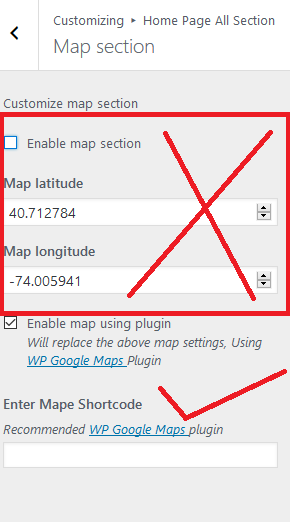 Enable map section: Checked to enable map section. 4. If preview is fine click on “Save & Publish” button to save the changes. Publish” button to save the changes. 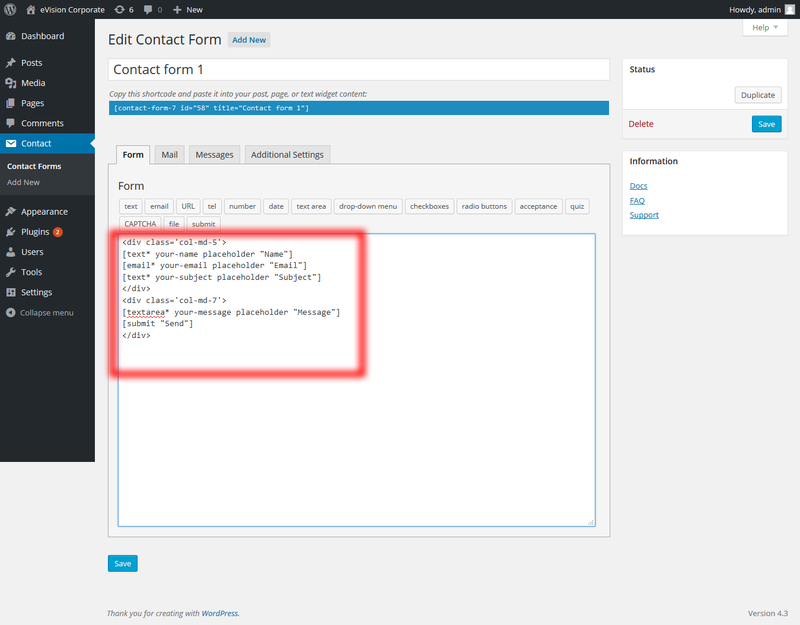 Replace by following code on contact form editor to get same form structure as demo site. 1. Enable contact section: Checked to enable contact section on front page. 2. Contact section main title: Give the title for contact section. 3. Enter CF7 short code: Enter the short code given by “Contact form 7”. 4. Contact section background: Select the image for contact section background. 5. If preview is fine, click on “Save & Publish” button to save the changes. After completing this section the setting of all sections for Front Page Completed. Please remember that you can always enable/disable each section. An each section comes with different and unique features and design. 1. 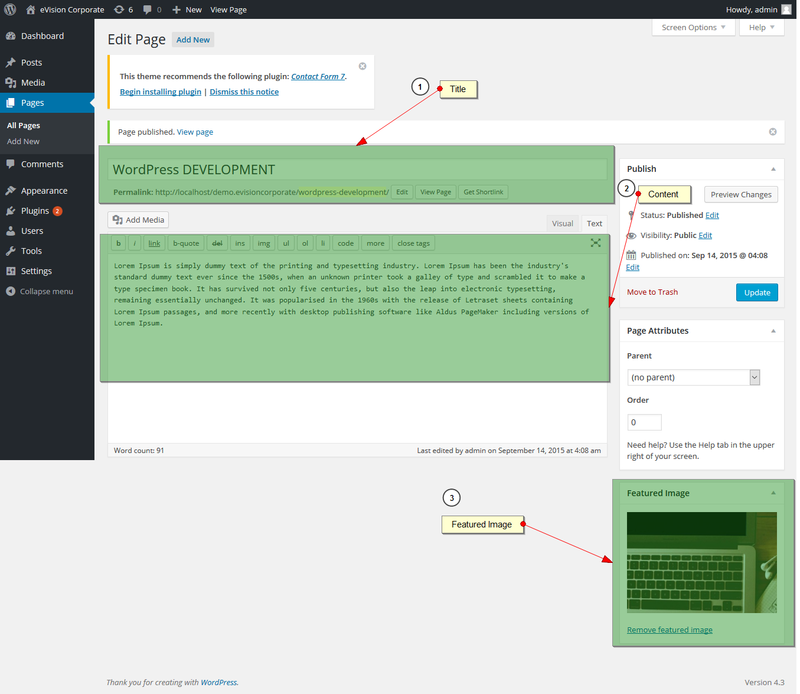 Content- Primary Sidebar: Content is displayed on left side and primary sidebar on right side of page. 2. Primary Sidebar-Content: Content on right side and primary sidebar on left side of page. 3. Full Width, no sidebar: Sidebar is not present this layout. Content will appeared on full width of page. Site logo is managed from this section. 1. Logo: Upload the image for site logo. When logo is uploaded, site title and description will be replaced by logo. 2. If preview is fine click on “Save & Publish” button to save the changes. Site footer section is managed by this section. 1. Copyright text: Enter the copyright text of site which is appeared on the footer. 2. Enable social icons: Before enabling social icons, first please assign the social menu from menu section. ( We will cover menu adding section in below section ). 3. Enable go to top: Checked to enable go to top icons on footer. 1. Write the custom CSS here. 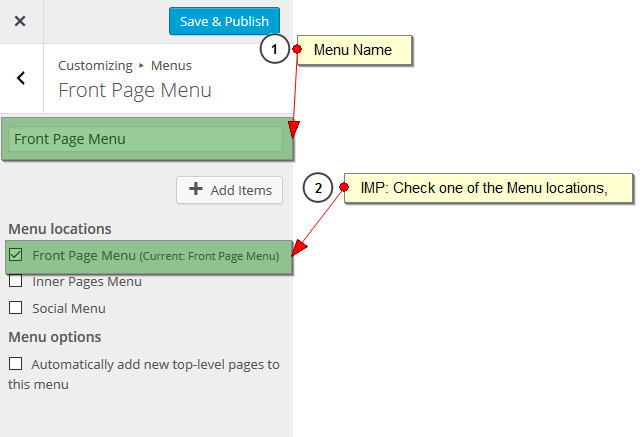 Front Page Menu is specially created for One Page Menu. 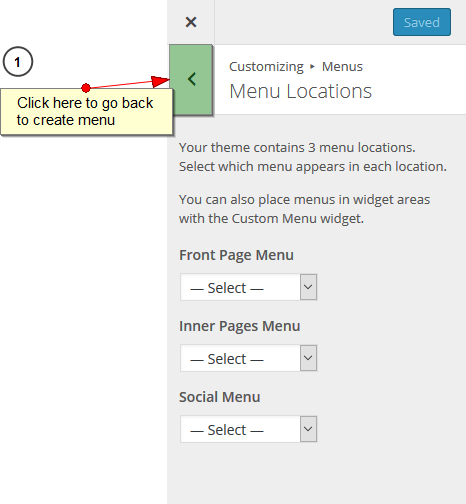 For one page menu please enter #evision-corporate-slider on URL and ‘Home’ on Link Text. Similarly the available section for one page menu are 10. You can use any of the following in the URL of the Custom Menu. Don’t forget to click ‘Save & Publish’. Setting up Inner Page Menu is same like Setting up Front Page Menu. It will appear all pages except front page. Similarly you can setup Social Menu. How to make contact form as in demo site? This option is not available in free version. this option is available in premium version.